Ellen Daehnick—aka Helliemae—had a problem: she couldn't find the caramels she loved on the shelves, caramels that were intensely dark, full of character, and made with plenty of flaky, crunchy sea salt. To remedy this issue, she began handcrafting her own, developing complex confections in small batches. She didn't come from a culinary background, although you wouldn't know it from a taste; starting with her Classic Salt Caramels, she's grown to turn out a range of Hell-on-wheels flavors, plus heavenly caramel sauces and other childhood treats. What does HELLIEMAE'S mean to you? Helliemae's means retro desserts like caramels and banana pudding with a Hell-on-wheels twist. If Helliemae were a person, she'd be Rosie the Riveter's best friend, a sassy 1940s broad who spends time canning produce from her victory garden after a shift at the munitions factory. Our products taste like your childhood, even if you've never had them before. Nostalgia, amped up with great ingredients and contemporary techniques. Killer caramels and desserts with retro roots. The best ingredients, coveted techniques, addictive treats. Magic made out of a mid-century service station. Tell us about your relationship with sugar. Sugar is beautiful and complex: it hits your tongue and creates a huge rush of pleasure in your brain; it's chemically necessary for your favorite baked goods; and, you can liquify it with just heat and caramelize it, creating all sorts of different flavors. Scientists are still figuring out what makes sugar tick. For example, lots of folks have observed that the melting point varies significantly. One academic argues that it's because sugar doesn't melt, it decomposes. Decomposes! The idea of a food developing all this great character through decomposition is delightful. The best caramel is complex, intense and a little challenging. Deeply caramelized sugar yields notes of chocolate, coffee, whiskey, vanilla - even smoke and tobacco. That caramel? It's really hard to find, even in this era of salted caramel everything. So I started making my own: dark and smoky, with a ton of the best butter and cream for a fresh texture. Every time someone tries our caramels for the first time and his or her head explodes with joy at the discovery of what caramel can be, I know we're doing it right. HOW HAS THE PROCESS CHANGED SINCE YOU STARTED? 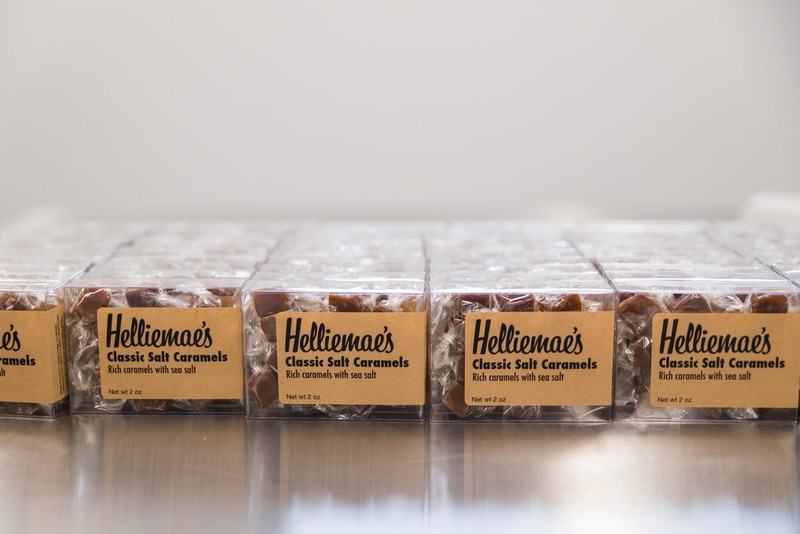 When I started Helliemae's, it was me alone in a kitchen, making three pounds of big caramels at a time and wrapping them by hand in wax paper squares I cut off the roll. Fast forward a few years, and I have a kickass team that helps me make, package and share our products. About a year in, we had the chance to buy a caramel wrapping line built in France in the 1950s. It's beautiful and allows us to make these little tiny caramels wrapped in compostable cellophane, perfect for popping in your mouth. True to its heritage, the equipment is also temperamental, which has tested the limits of our DIY capabilities. Humbling! WHERE DO YOU FIND INSPIRATION FOR FUTURE PRODUCTS? Inspiration comes from all over. Chili Palmer, our chili cinnamon caramel and sauce, was inspired by a character created by one of my favorite authors, Elmore Leonard. Banana pudding with salted caramel sauce came to life when a friend and I were discussing how the concept of banana pudding is always so much better than the reality - I asked, could we make a version that lived up to the idea we all carry in our heads? One of our newest products, whiskey butter cookies, are the baked embodiment of things that should be together, always: butter, sugar, whiskey, vanilla.